JUST REDUCED!!! 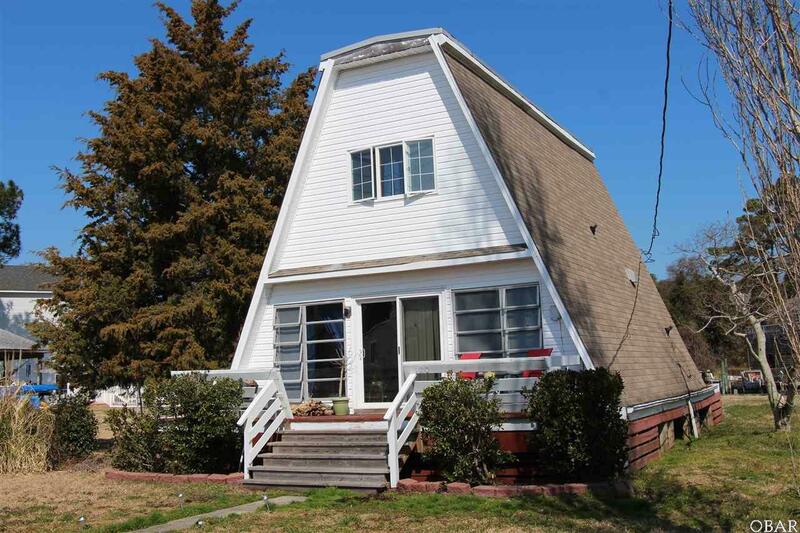 INVESTMENT OPPORTUNITY - Cool Vintage Cozy Canalfront home - PRICED TO SELL! Home includes 2 bedrooms, 1 full bath and 1 half bath. Bottom level features open floorplan with two sided wood fireplace separating dining, full bath and living area with back deck overlooking the canal. Top level consists of 2 large bedrooms with large closets and half bath. Recent upgrades include NEW septic field and NEW pipes and insulation all to code. Back yard includes a large shed with attic canal side perfect for storing all your water toys. 50ft bulkheaded deep water canalfront lot on the Baggala Inlet. Take a short boat ride through the harbour out to Albemarle Sound. Colington Harbour is a year round gated waterfront community: http://colingtonharbour.net/dev/. For an additional fee join the Colington Harbour Pool and Raquet Club. Home has month to month renters - 24 hrs to show - renters have nice large black dog. Sold "As Is - Where Is". Buy Now, use as a rental, build your dream waterfront home in the future. So many possibilities!